we should have earned our stripes, or established our “Green Pedigree” so why trouble with the “Green Deal Certificate” ? 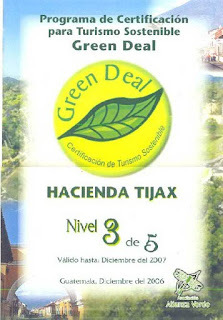 First because we (Hacienda Tijax) think of ourselves as members of a wider network of Institutions and business that genuinely want to keep Guatemala “Green” and literally save the planet, we work closely with Alianza Verde, Rainforest alliance the “Green Deal” people and many other Institutions like the CONAP, ECORIO, FUNDAECO, MADRESELVA and many others on issues such as the Mining in Izabal, Garbage Collection and processing, reforestation and more. 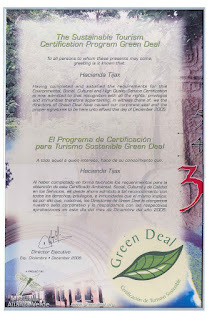 In fact by being one of the first to sign up and participate we hoped to give the Green Deal Seal recognition and a chance to be accepted as a “brand” with some meaning for the visitors and users of our services. In order to obtain the Certificate we had to comply with endless paperwork mostly to prove compliance with all existing local laws such as: labor legislation, safety and security, sanitation and cleanliness, taxes and legal framework of the company, land ownership; is it registered? do we have a contract with the government for the shore line? and much more. The “Green Deal” evaluating team reviewed our books, our social security payments, our payroll to insure proper wages are being paid and so on. So when and if you do visit us you may see we proudly post our “Green Deal” certificates and you should know that our staff is well paid, that we do pay taxes and social security, pick up our trash and try to keep the planet healthy. Now about having a Swimming Pool, first let me say that the vast majority of visitors DO NOT complain about the Pool, second let me say that no matter what mitigating measures a place like ours implements it will have an impact on the environment. The important thing, I think, is to carry out enough positive actions like the ones mentioned above in order to offset the inevitable negative impact from the presence of humans in a given space. So if the pool is a no-no please forgive us we promise to continue doing a lot more good than harm to the environment.